The Chillisima Hamper is filled with luxury Italian chilli products, the ideal gift for every chilli lover! Chilli Chocolate from Sicily (70g). Our chilli chocolate is produced in Modica, Sicily following an ancient Aztec recipe. It's healthy, dairy free and has a unique, crumbly texture and spicy taste. Viagro Chilli Infused Oil (100ml). Made from some of the most potent chillies in Calabria, Southern Italy, this chilli infused oil can be added to pasta, rice, meat and fish dishes, pizza and bruschetta. The producers have christened it an 'Ancient Aphrodisiac Remedy' and advise that it should be 'taken every day' for maximum benefits! Garlic and Chilli Pepper Oil (175ml). The perfect oil for adding to spaghetti or other types of pasta to make the famous 'Aglio, Olioand Peperoncino' (garlic, oil and chilli) dish. We love it too in salad dressings and drizzled on a bruschetta. Hot Chopped Spicy Chilli Pepper Spread (190g). This super-hot chopped chilli spread can be added to just about anything! From bruschetta, to pasta sauces, risottos to pizzas, it's guaranteed to liven up any meal! Chilli Powder (100g). This finely ground, super-hot, Calabrian chilli powder is another very versatile ingredient for all of your Italian dishes, but be warned a little goes a long long way. 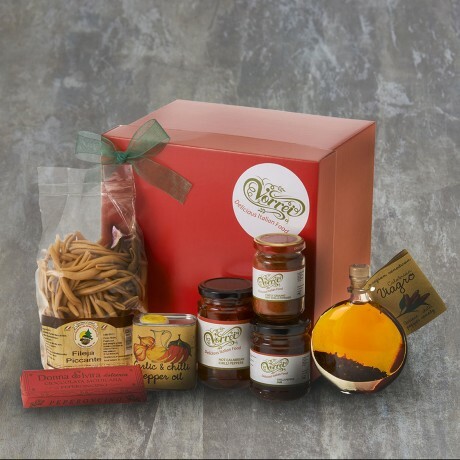 These wonderful Italian chilli products are presented in a fiery red gift box which is tied with a big red ribbon. If you wish you can add a personalised gift message at the checkout. Please note that if we are out of stock of any item we reserve the right to substitute it with the most similar available item.